This entry was posted on August 1, 2010 by Sean Kane. It was filed under Photos and was tagged with ars-33, HDR, mothball, Photography, ship, suisun bay, uss clamp. Nicely processed image with great light. Well you’ve done very well with the steady-cam! Very nicely done. One could say that I have good sea legs. 🙂 Thanks, AC. I love this shot, and I’m very impressed that you managed to get a HDR from a moving boat! I’m a fan of this one too. Thank you, Journey and thanks for stopping by! This is a really great shot! I wouldn’t have guessed HDR because the processing is so subtly. 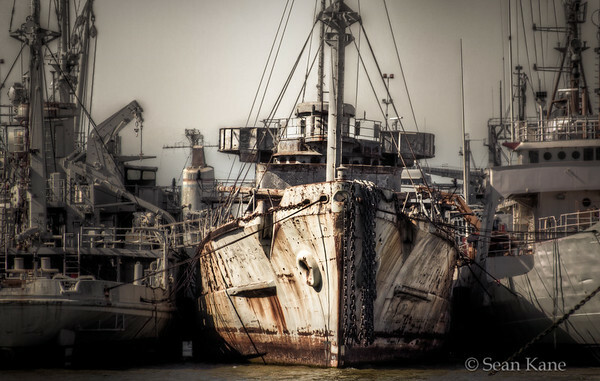 You really captured the ‘ghost fleet’ feeling. Just wonderful! I was going for, as I usually do with HDR, something closer to what I see when looking at a scene like this. Yes, this has some post-hdr processing to emphasize the mood, but I like subtle. Thank you, Tracy.